DB Corp Ltd (DBCL), India’s largest newspaper group, is celebrating the 20th anniversary of its flagship paper Dainik Bhaskar in Rajasthan. The paper was launched in Jaipur on December 19, 1996. To mark the occasion, Dainik Bhaskar is hosting a Rajasthani Pagdi Tying contest in various media agencies across Mumbai, Delhi and Bangalore. The contest started yesterday (February 9, 2017) with Dentsu Mumbai, Madison Bangalore, and Havas Media and Initiative Media Delhi. The contest saw enthusiastic participation from media planners, buyers and agency executives. 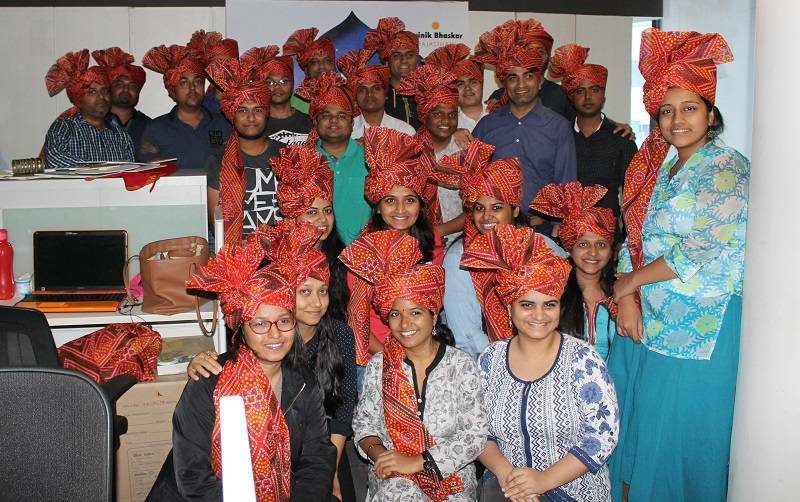 Hitesh Jain, AVP, Investment Director, Havas Media, who found the Rajasthani Pagdi Tying contest to be a very nice event, also extended his congratulations to the entire Dainik Bhaskar team. Venkatesh, a Vice-President with Initiative Media found the event to be very well organised and a great engagement initiative.